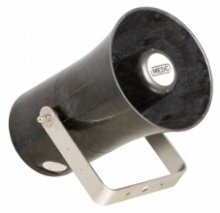 This range of loudspeakers, intended for use in potentially explosive gas atmospheres, has a power rating of up to 15 Watts and is suitable for use in gas groups IIB plus hydrogen and IIC. The flamepaths, flare and body, are manufactured from a UV stable glass reinforced polyester. Stainless steel screws and mounting stirrup are incorporated to ensure a corrosion-free product. Exde IIB + H2, IIC T4/T5/T6. Certified temperature: –40°C to +65°C*. 116 dB(A) at 20 Watts at 1 metre. 8 and 15 Watt versions.